This dinner was Matt's answer to what to do with 1/2 lb of leftover ground beef without making burgers again. It isn't completely tradition, but it is based on the Middle Eastern dish Kofte. Kofte is usually either ground lamb or beef seasoned with various herbs and spices. It is cooked as a meatball or grilled on a stick as we did. We decided to serve them similarly to a gyro with tzatziki (yogurt/cucumber sauce), tomatoes, onions and lettuce on flat bread. Matt wanted to make a flat bread from scratch that he could cook on the grill. I thought he would just use our grilled pizza crust recipe, but instead he came up with his own version using whole wheat flour and buttermilk. They were really tasty, but came out thicker than we would have liked. (I ended up slicing them in half to use like a bun instead of wrapping the meat in them.) Matt says next time he'll roll them out thinner before putting them on the grill. This was a great alternative to burgers. To me it seemed even better suited to hot weather with the cooling toppings. 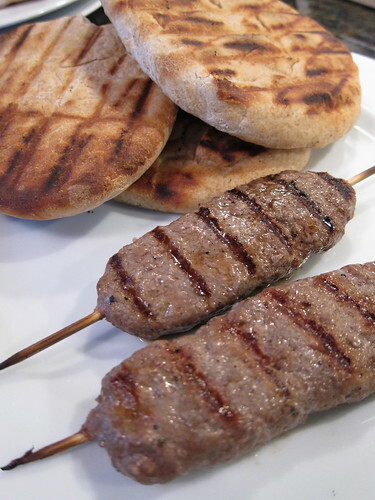 I think kofte is something that will end up in our summer grilling rotation. Mix everything together. Shape into three flat sausages about 1/2-inch thick. Put skewer through the middle length-wise. Grill on high for 2 - 3 minutes per side. Combine dry ingredients in a stand mixer. Stir to combine. Add buttermilk and mix until it forms a ball. Knead for about 5 minutes. Let rise for 2 hours until about double in size. Cut into pieces, roll until balls then roll into thin, flat discs (I would shoot for about 1/8-inch). Brush with olive oil and put on grill set at medium-high. Brush other side with oil and flip. Cook 2 - 3 minutes on each side them put on cooler part of grill to continue cooking and keep warm while meat is cooking, about 5 minutes. We made 4, but they were quite thick so next time we'd probably get 6 out of the recipe. 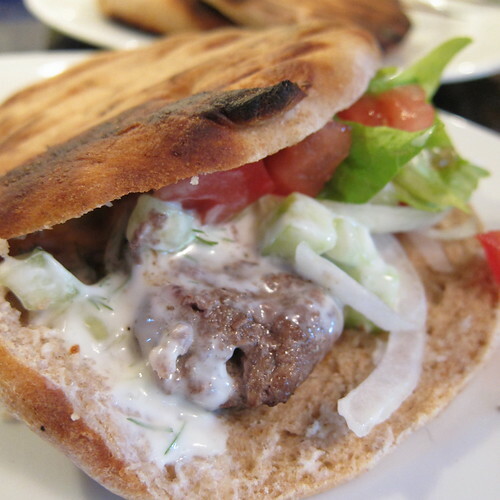 Serve the kofte and bread with tzatiki, lettuce, onions and tomatoes. i have to say that this is a much more appealing option than a plain ol' hamburger. nice job! This sounds great! I have to try that flatbread too. Trying to make flatbread has been on my to-do list. I love kofte! Perfect for grilling season! Oh yum. Love the flatbread.